Unlike the Western Zodiac which is divided into 12 months, the Asian Zodiac is divided into 12 years. Each year is named after an animal: the rat, ox, tiger, rabbit, dragon, snake, horse, sheep, monkey, rooster, dog and boar. All Japanese people know the animals of the zodiac, so they can cunningly guess your age by asking you what animal you are. People whose zodiac sign is the same as the year's sign are called "toshi-otoko". So this is my year as I was born the year of the snake. I think being "toshi-otoko" brings good luck. 12 years ago, I met my wife when I was "toshi-otoko"! I wonder what lucky thing will happen to me this year? 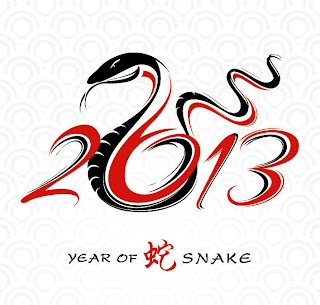 By the way, people born the year of the snake are said to be profound thinkers and have tremendous wisdom. They often have a good temper and are financially secure. OTOH, they can be vicious and vain. The next time the "Year of the Snake" rolls around, I will have completed 5 full cycles of the Chinese Zodiac. This is a very special birthday in Japan known as "kanreki". I was born in Wild boar year. I am the dog year. There are another five years. people born in the snake year are also very strict !! watch out guys don`t be late or absent !! !